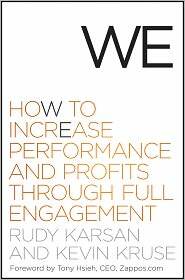 A couple days ago I began reading “We: How to Increase Performance and Profits Through Full Engagement” by Rudy Karsan & Kevin Kruse. The book has spent time on both the New York Times and USA Today Best Seller lists. I skimmed through the book and at a first glance it looked pretty good! So I decided to give it an in-depth read. So far I have read two chapters and I am super stoked about this book so far. Stay tuned for a book summary in the near future. If you want to check it out now, visit the author’s website for lots of resources, chapter summaries and other goodies. The introduction to this book begins with something the author’s call the “We Test.” I think every person alive, and working for a living, should take this test. Which I why I am passing it on to you. Before reading any further, stop and answer that question! Seriously… stop. Write something down! The test doesn’t work if you cheat and read the next paragraph without actually answering the question! I challenge you to scroll down, and leave your answer in the comment section below before continuing. Kruse and Karson go on to pose an insightful follow up question… Did you answer the first question with “we” or “they” when describing the work of your employer? The answer to this question tells you whether you are engaged in your work, or passively allowing the world (and work) to pass you by! I have to say, I was floored by the simple, yet profound nature of this little test. Are you invested, passionate and energized by what you do? If you are, you probably answered with “we“. If you find yourself punching a the clock and looking forward to the weekend… all week long, I’m guessing you answered with “they“. I just started a new job as the principal of Greece Athena High School in Rochester, New York. I absolutely love my job. I look forward to work every day. Granted, I am still in the honeymoon phase, but I find every moment exhilarating. My answer to the “We Test“, was “We are empowering and equipping the next generation to make the world a better place.” What was your answer? To be honest though, many jobs in my past would have warranted a “they” response. If you can answer the “We Test” with “We!” you are clearly One Grip Higher!